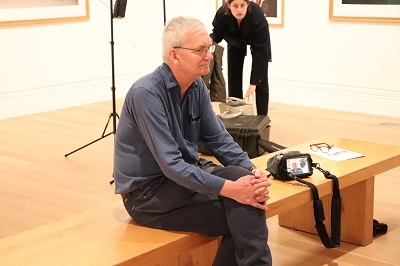 The National Portrait Gallery presents a new exhibition entitled Only Human: Martin Parr which features works by one of Britain’s best-known and acclaimed photographers. 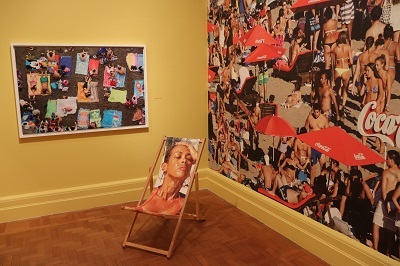 The exhibition brings together some of Parr’s best known photographs with new work by Parr never exhibited before. 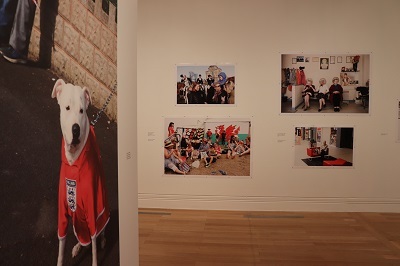 The exhibition examines national identity, both in the UK and abroad with a special focus on Parr’s well known observations of Britishness. Parr made his reputation as a photographer in the 1980s, exploring the world of leisure activities. Parr carries on this theme with photographs of trips to the beach, tennis tournaments and a day at the races. It is these places where the public and private meet and where people can play with their identities, dressing up in a variety of ways. Another popular theme for Parr is dancing, the photographer documents people dancing across the globe. Although best known for his portraits of ordinary people, Parr has photographed celebrities throughout his career. 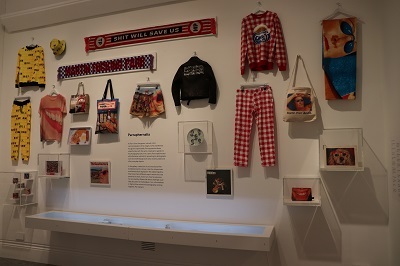 The exhibition features a selection of portraits of personalities often in unusual settings, most of which have never been exhibited before, including Vivienne Westwood, Paul Smith, Tracey Emin, Grayson Perry and Pelé. A lesser known aspect of Parr’s work is his self-portraits, for over thirty years, Parr has visited studio photographers, street photographers and photo booths across the globe to have his portrait taken. 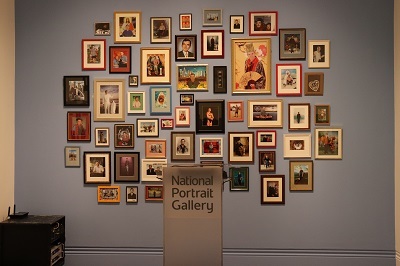 The section entitled Autoportraits explores portraiture and portrait photography with a wide range of serious and humorous settings employed by professional portraitists. 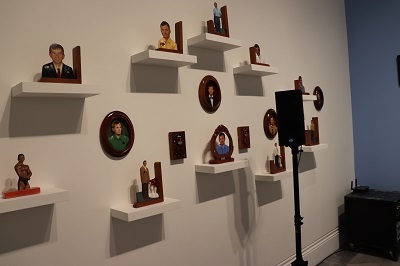 Parr’s Photo Escultura is a group of shrine-like carved photo-sculptures commissioned from the last remaining traditional maker of this type of work in Mexico City. 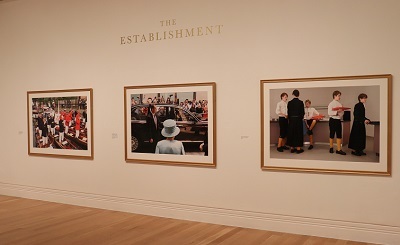 The exhibition features a section of the British Abroad and Parr’s well known study of the British ‘Establishment’ including recent photographs taken at Christ’s Hospital school in Sussex, Oxford and Cambridge Universities and the City of London, revealing the eccentricities and ceremonies of elites in British life. In the final room, new and previously unseen photographs reveals Parr’s documenting the social climate in the aftermath of the EU referendum. The exhibition also includes a pop up ‘caff’ and shop which has lots of ‘paraphernalia’ developed from Parr’s photography. This fascinating and entertaining exhibition provides plenty of evidence that the ‘British identity’ is often an ‘illusion’ produced for public display. In a public arena, people often dress up in a way that illustrates their ‘Britishness’. But how representative is this show of patriotic fervour ? 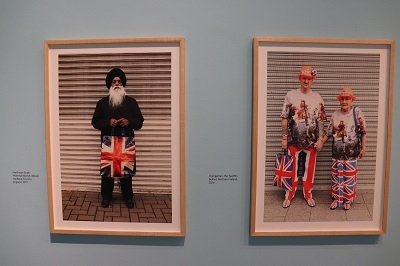 Images like those in the exhibition seem to perpetuate and challenge stereotypes in equal measure. Underlying the humour of Parr’s work, there is serious questions of how ‘identity’ is forged by the individual and wider society. By londonvisitors2014 in Exhibitions on March 6, 2019 .